New York and London Fashion Week just over so are you inspired by for Autumn / Winter 2014 trends and shows. Have you ever wish you could own your runway show? Perhaps someone can make your dream may come true… Calling for fashionista, stalista, bloggers the time has come for you to unleash your talents at Project Style Star. Get ready to flaunt your style, be on stage and own your runway show. Omg… did I say you can now assemble your muses, style them up, let them strut the runway and walk away with awesome cash prizes. 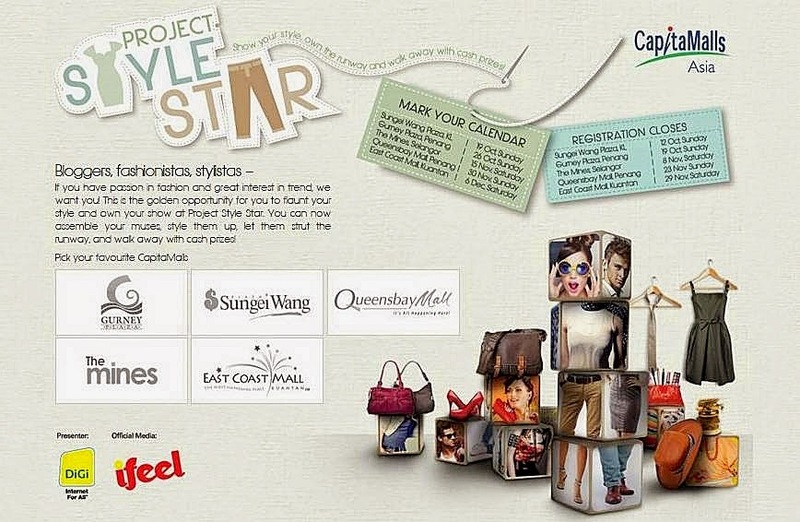 Well, basically Project Style Star is a contest organized by CapitaMalls Asia. This is an opportunity and platform for fashion lover age 18 and above like you to showcase you style on the stage. The contest will be held at 5 malls respectively, namely Gurney Plaza at Penang, Sungei Wang Plaza at Kuala Lumpur, Queensbay Mall at Penang, The Mines at Selangor and East Coast Mall at Kuantan. If you passion in fashion and great interest in trend, don’t think twice just go for it. You got nothing to lose but a lot of experience and cash to gain. 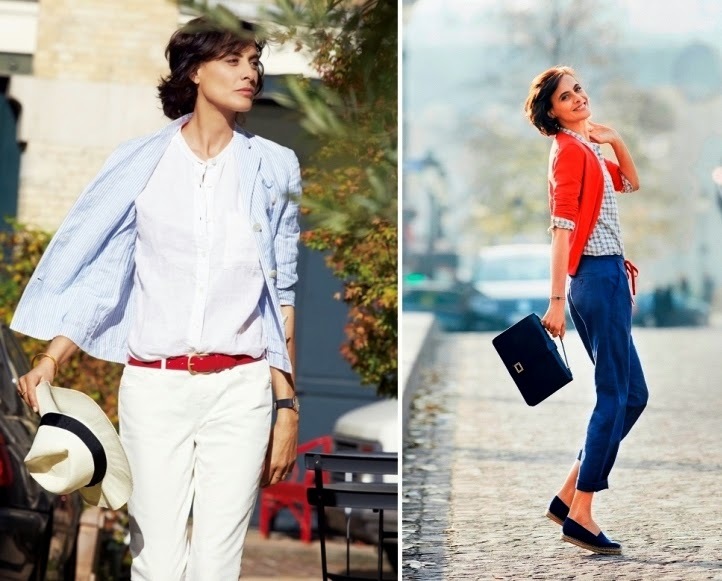 Join the contest by just log in the contest apps here at http://bit.ly/1B0GfYS Fill up your particulars, give a 50 words description of your style showcase and submit. 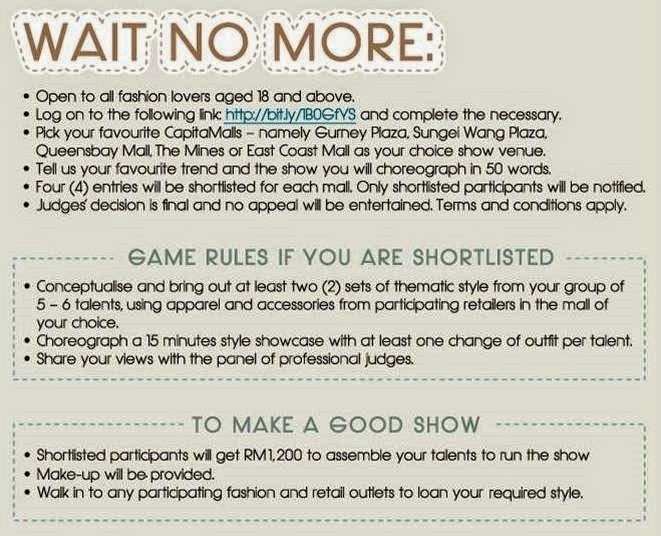 Please take note only 4 contestants will be selected from each mall to conceptualize, bring out at least 2 sets of thematic style using only clothing and accessories from the respective participating mall’s tenant, orchestra 15 minutes style showcase, go on stage to showcase and explain the style to a panel of judges and public. Please take note of registration deadline. Hmm… what fashion style should I conceptualize and submit? Thinking… should I go for seasonal, futuristic, street, goth, punk, rock, oriental or classic. Well I will let you know in my new post. So stay tune… in the mean time I am sure you have your own fantasy and style that you would like to share with other. Don’t forget to submit your because you stand a chance to be selected. b) Make-up for your models will be provided. c) Walk in to any participating fashion and retail outlets in the respective malls to get clothing and accessories to dress up your models. Project Style Star looks pretty cool! Love to dress up and look like a star. There are 2 malls in Penang - Gurney Plaza & Queensbay Mall you and your friends can participate too.